WHAT PLAYED out at the Diepkloof Hall, in Soweto on a Summer Sunday morning, a mere six days into the New year, was not so much a rendezvous of sadness, as it was one of celebration. The scene, set out for a farewell of a societal luminary, resembled razzmatazz than what the Book of Ecclesiastes reminded mortals as there being a time to die. Fellow veteran radio presenters, Bob Mabena and Nomshado Twala (in black headgear) spotted at the funeral service of late jazz presenter, Meshack Mapetla, at Diepkloof Hall, in Soweto. All images Jacob MAWELA. Rather, an appropriate description of what unfolded could be found ensconced in the verses of American poet, Langston Hughes and South African counterpart, Donato “Zinga” Mattera, respectively! Yep, your imagination can run wild – it was the confluence of Harlem be bopping to Sophiatown. The common denominator in all this, was Jazz and the harbinger of this rendezvous was the dearly-held memory of late radio presenter, Meshack “Bra Mesh” Mapetla – for whom hundreds of the music art form’s adherents had come to bid adios! It was a black and colour affair – the former, a requisite wont at such austere occasions and the latter, a celebratory expression of a lifestyle! Material was in abundant display, “Ousies” resplendent in their silky dresses complimented by appealing hosiery and “Outies”, a la daddy-o’s, bedecked in two-toned brogues, fedoras and berets! American sounds converged with Seffrican Scamtho – the language, or taal if you like, of klevas van toeka af! A different and dying breed, die ouens en volk (guys and folks), what author, James Fennimore Cooper would had referred to as, Last of the Mohicans. So much so that upon spotting the writer of this piece, Slick Kgosi – a well-known socialite whose other claim to fame is his young self being depicted in a mid-1950”s Drum magazine image by Bob Gosani also featuring his sibling, Fanny and Isithwalandwe, Father Trevor Huddleston walking on a Sophiatown street whilst holding onto the man of cloth’s cassock – teasingly suggested that “you’ll have to get old before you could dress like us!” This remark, in response to having expressed admiration for the dress sense on display. Inside the packed hall, a stomping programme progressed in both groovy and turns of mood flows as reminiscences of Mapetla interspersed with music, not only of the jazz genre but also that of the operatic and gospel variety – and a dirge too. Refrains such as Time to say Goodbye; a vocal rendition of Frank Sinatra’s I did it My Way by Thapelo Mofokeng; a trumpet solo of How Great Thou Art by veteran Stompie Manana and a lonesome saxophone dirge titled Hamba Kakuhle by Sipho Mabuse; O when the Saints go marching In – swirled the space and stirred the collective sense of hearing with a rather auspicious ambience. The roster of musicians who mainly played impromptu and improvised, included Prince Lengoasa and David Ramogase – who treated the gathering to a simultaneous double pennywhistle offering. Reminiscent of when a grandson of the late Minister of Environmental Affairs, Edna Molewa referred to President Cyril Ramaphosa by his first name, at her funeral – Mapetla’s nephew Naledi Chauke, momentarily diffused the sombre mood within the venue and to collective mirth from attendees, when he brusquely requested to dispense with formalities and enjoined, “Can I say malome” instead of Bra Mesh, whilst reading the obituary. 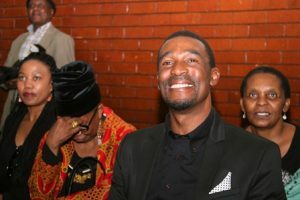 With the time of proceedings being adjusted by the presiding priest, the obituary reading had been preceded by reflections by the late jazz presenter’s children, his son, Karabo and daughter, Neo. im as, “Kari” and him in turn as, “Pops”; an influential figure in his life who taught him how to ride a bicycle, in addition to a father he’s very proud for having been his son. As colleagues, NomShado Twala, Bob Mabena, Treasure Tshabalala, Koos Radebe and Lesedi FM’s Lehlohonolo “Kakapa” Tsolo cast their gazes to the stage whilst listening, renown broadcasting personality, Tim Modise put it to the audience: “Bra Mesh was a seed which became a forest – a re mo felegetseng ka Kagiso (let’s bid farewell to him in peace). A while later before proceedings shifted on to Westpark Cemetery, some mourners initiated impromptu jigs showing off their nifty footwork and moves next to the casket and the area of the hall the bereaved family at large was seated. It was all in the spirit of thing as an audience which numbered yesteryear soccerites such as Big Boy Kholoane, Jackie Masike and other movers and shakers such as Standard Bank Joy of Jazz promoter, Peter Tladi, Kid Sithole, Tom Mphatsoe and Sedibeng Jazz and Arts and Culture Forum convener, Gift Makume – celebrated the essence of how they got to cross paths with Bra Mesh. For Makume, very much a picture of a man-about-town in double-toned Johnston & Murphy brogues and a white Dobbs straw-hat, he’ll remember Mapetla as a catalyst who assisted in the formation and sustaining of jazz networks stretching from his home region of the Vaal to the Free State and the North West Province. Taking out a framed picture out of his spacious Mercedes Benz, he intimated to the writer that Mapetla was instrumental in enabling him to personally meet with Wynton Marsalis (as evidenced in the framed picture) pending the 2010 edition of the Standard Bank Joy of Jazz. The third of seven children of the late Ntate Bahlakoana and Mme Puleng Mapetla, “Bra Mesh” was born on 14 April 1947 in Newclare, Johannesburg. His illustrious music career started in 1968 when he began his first job with the South African Broadcasting Corporation. Working in the music section of the broadcaster’s library, he thereafter, joined the then recently launched Swazi Radio (SR) radio station. Later leaving Swazi Radio, he served a short stint with a record producing company named Priority Records. That was at about the time that Radio Metro was launched by the SABC and he joined the radio station as a presenter of different genres of music which included jazz and soul. The radio station became popular amongst black listeners and attracted a large audience. During that period, Bra Mesh’s proclivity towards jazz in his programmes made the station popular amongst jazzophiles who inundated him with invitations from jazz lovers who requested him to present (compere) at their events. 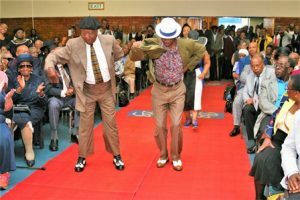 Jazzophiles suitably dressed in two-tone brogues boogied inside Diepkloof Hall, pending the send-off of renowned radio presenter, Bra Mesh Mapetla. Upon leaving Metro, he continued presenting jazz for the station on a part-time basis – whilst also presenting jazz programmes at a number of jazz sessions. It would be no exaggeration to state that through his love for jazz and his programmes, he was instrumental in the revival of jazz which was then being eclipsed by other kinds of popular music. The Department of Arts and Culture honoured him during a Wynton Marsalis Concert, and was invited to New Orleans where he subsequently attended the New Orleans Jazz Festival. A person with an extensive knowledge of jazz, he was bestowed with awards by various jazz clubs. He was an affable person who was liked for his humour, gentle nature, jokes and permanent smile. Bra Mesh passed on, on New Year’s Day after a long illness. He is survived by his wife, Thembi, daughter, Neo, son, Karabo, a grandson and two brothers, Shadrack and Tony. In the aftermath of Mapetla’s passing,Life@40’nBeyond founder and former jazz and R’nB presenter at Soweto TV, Terry Mokoena was quoted as saying, “I was very fond of Bra Mesh, and he was my mentor and loving friend. In March 2017 I organized an exclusive jazz concert, Premiership Jazz Concert, dedicated to radio jazz presenters and jazz collectors in South Africa. Bra Mesh was the first presenter to be honoured for his contribution in promoting jazz. I had an opportunity to present jazz music in his company at the Jazz Monate Sessions at Carnival City and Mogodu Mondays at Tavern Restaurant, at Maponya Mall in Soweto. Mokoena went on to mention that he was, along other interested parties, organizing a series of sessions in Mapetla’s memory titled, Bra Mesh Jazzuary Tribute – meant to bring together adherents of the music form from Soweto, Sandton and Johannesburg.